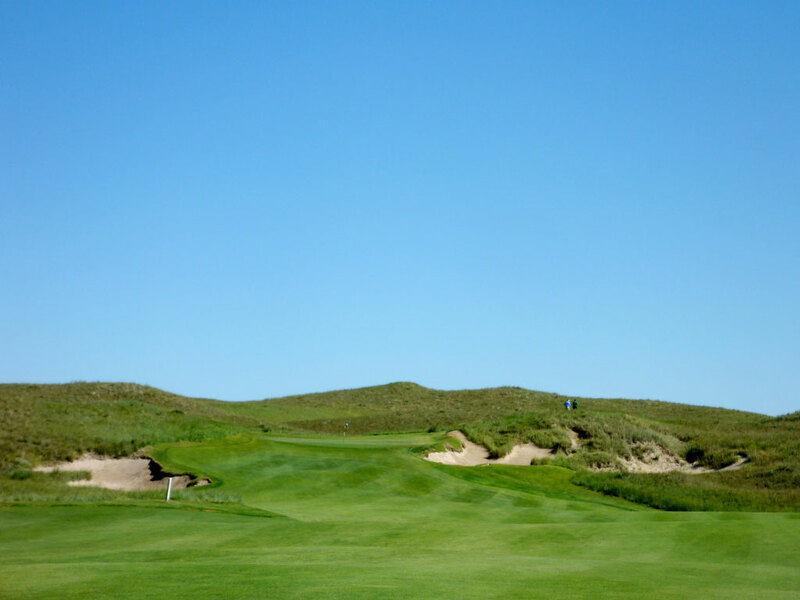 Accolades: Ranked 2nd in Nebraska on Golf Course Gurus' Best in State list. What to Expect: Sand Hills is isolated. Of course, to say that Sand Hills is isolated is like saying Antarctica is cold. 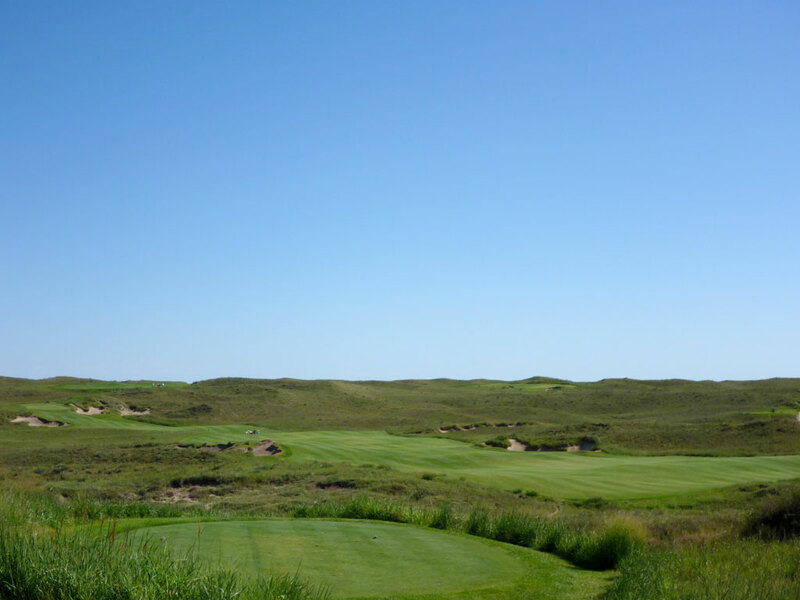 The Coore/Crenshaw course laid out in the middle of Nebraska is located outside Mullen; a town with less than 500 people that is over five hours away from either of the nearest major airports (Denver and Omaha). 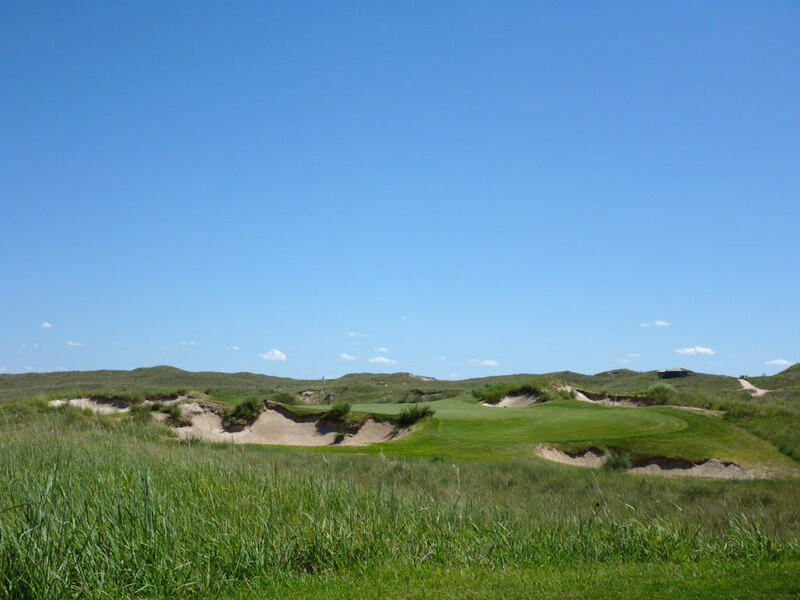 With eight thousand acres to work with, the Coore/Crenshaw team's most difficult job wasn't discovering potentially great golf holes on the property (they identified 130), it was deciding on a routing through the natural sand dunes that would include the best holes. 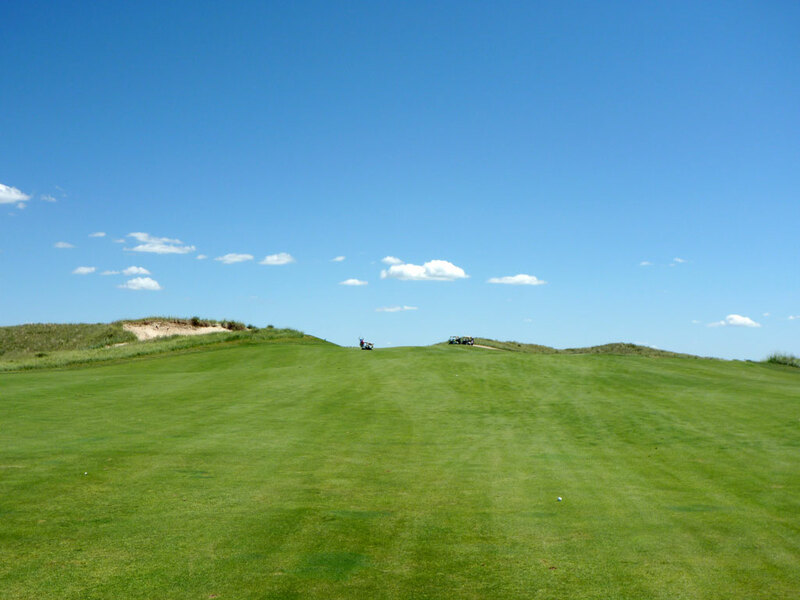 The result is what many consider the finest inland links golf course in America. Accommodations for about 55 people exist on the property and encourage golfers to stay for multiple days and several rounds. Carts and forecaddies are available at the club, but many patrons elect to walk. 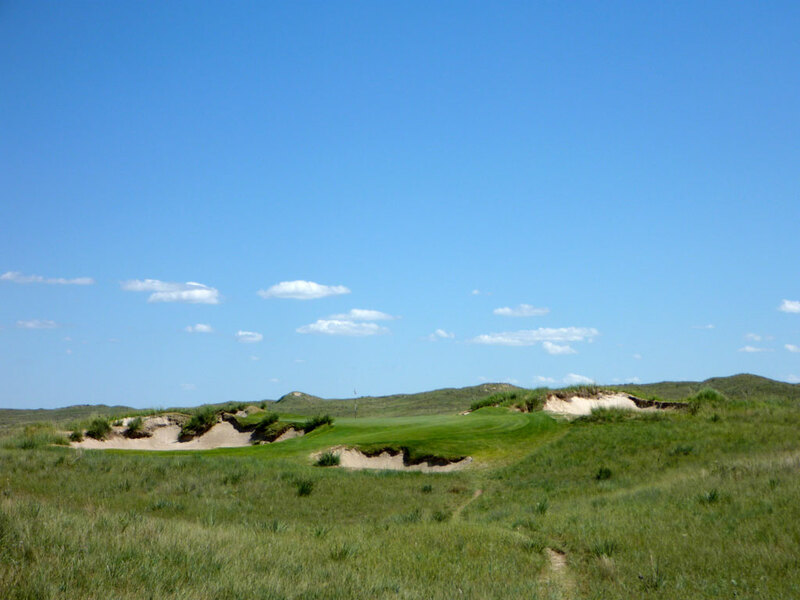 So what should you expect when going to Sand Hills? Expect to see the largest scale and most impressive bunkering you've ever seen. Expect many large, undulated greens and generous fairways. Expect wind to blow in every direction and an excellent variety of hole lengths and shapes. In the end, expect a no frills experience that is all about one thing - incredible golf. Signature Hole: 17th Hole – 150 Yard Par 3 – I nicknamed this hole "Stacy," my wife's name, because it is short and pretty. 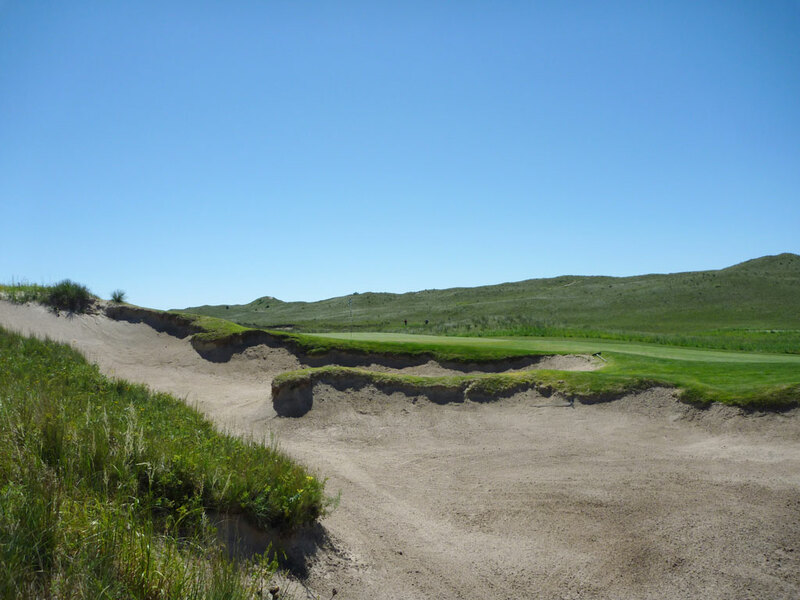 Sand Hills' most photographed hole is the final one-shotter of the routing and is an appealing short iron or wedge away. Contrary to the current trend of the 16th or 17th hole being a long par three, the Coore and Crenshaw team elected to finish with beauty and style rather than bruising and conventional. The result is the most memorable hole on the course and the subject of praise from multiple sources "in the know." Best Par 3: 17th Hole – 150 Yards – The darling on Sand Hills, Coore and Crenshaw based much of their routing on the greatness that holes 1, 17, and 18 would offer. The short uphill three par features a deep bunker up front and a putting surface that is mostly hidden from the tee. For a brief time, an additional tee was added which lengthened the hole by some 20 yards, but was abandoned in favor of embracing the original layout and design characteristics which were better suited for a 150 yard hole. The views and backdrop are both stunning and saddening as you realize your round at Sand Hills is coming to an end much quicker than you imagined. Best Par 4: 4th Hole – 485 Yards – Some architects infiltrate a multitude of features on a hole in an effort to produce 'greatness,' however Tom Doak and the Coore Crenshaw team have an amazing knack of being able to magnify a single feature in order to produce a great hole. The 4th hole is a prime example of this with the massive bunker featured up the left side of the hole. The fairway slopes left-to-right away from the bunker which makes it difficult to challenge the hole on a line with the crater sized sand haven. If you take your tee shot up the left side you will be left with a shorter, but potentially blind shot, to the green. From the right side of the fairway you are left with a longer approach to a raised green. The crater bunker is a focal point both visually and strategically without forcing the golfer to play the hole a particular way. In the same realm of dominating bunkers as Pine Valley's Hell's Half Acre (7th hole), the 4th hole at Sand Hills is sure to be permanently engrained in the golfers mind the instant he stands on the tee box. Best Par 5: 1st Hole – 549 Yards – When you play a lot of different courses and elect to become a student of golf course architecture, you start forming opinions about routings, hole shapes, and design in general. One design methodology that I subscribe to is starting the course with an excellent hole. Too often the opening hole is so worried about being a "good warm up" that it becomes forgettable and devoid of architectural merit. 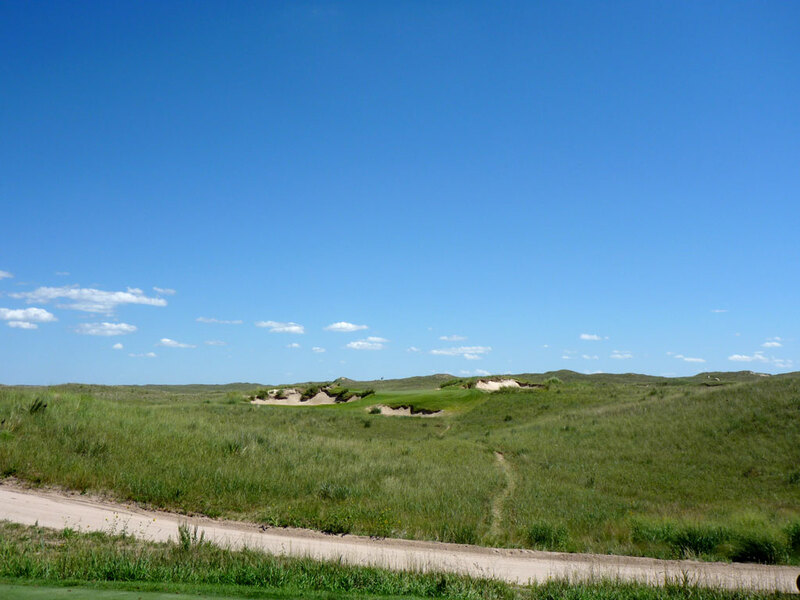 Coore and Crenshaw weren't willing to settle for mediocrity at Sand Hills and begins the course with arguably the finest hole on the course. 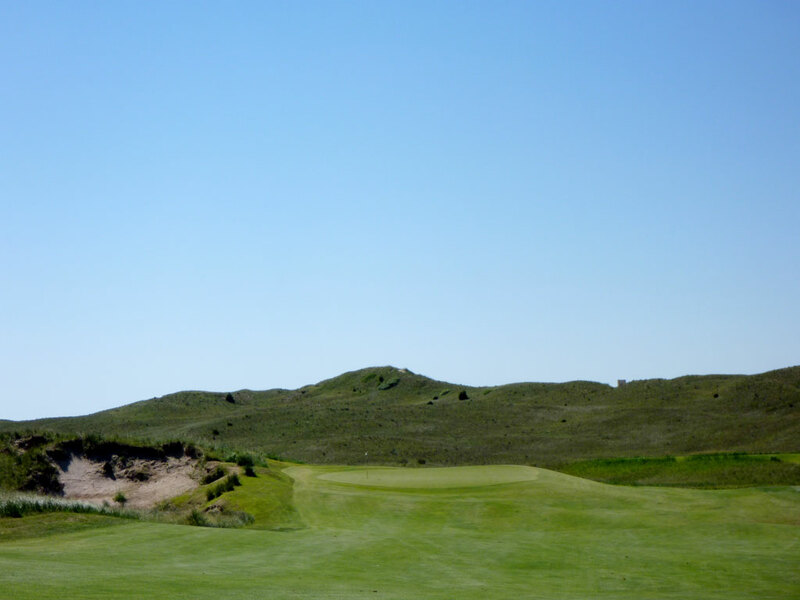 The opening par five embraces everything that makes Sand Hills spectacular; wide open isolation, creative contours, and the best bunkering on the planet. The hole plays straight out and then turns left and uphill to a raised green that is perched between artistic and challenging bunkers. 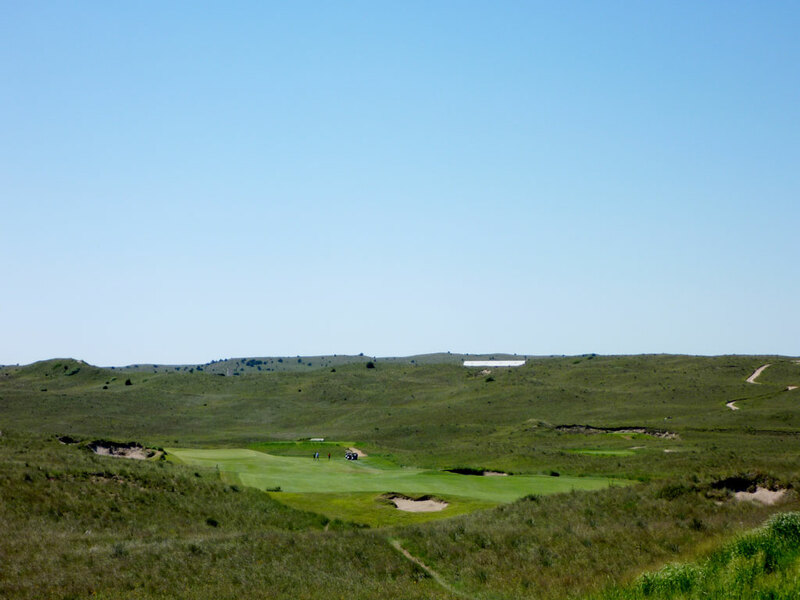 Right off the bat you'll realize two things at Sand Hills first hole; 1. You don't want to be in the bunkers. 2. This place is special! 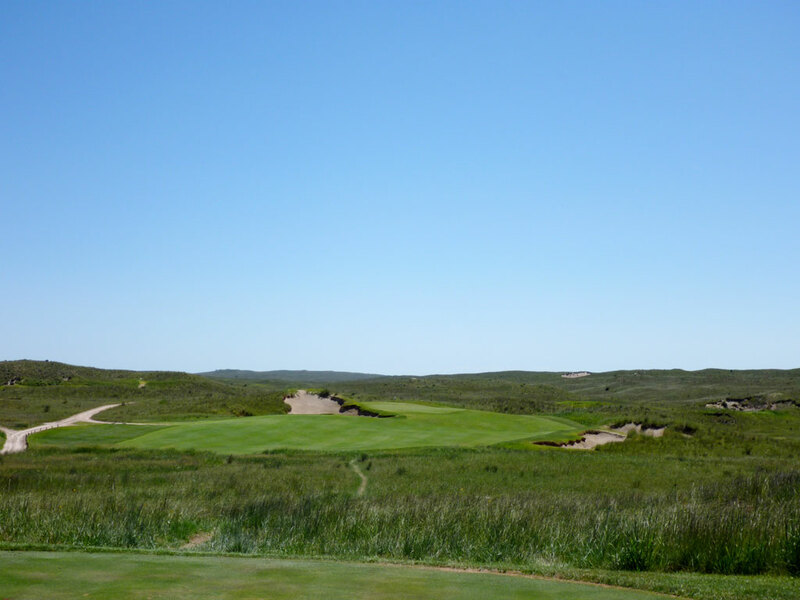 Birdie Time: 7th Hole – 283 Yard Par 4 – Regarded as one of the finest match play holes in the world, the sub-300 yard 7th hole at Sand Hills is brilliant fun. Many driveable par 4s offer a clear distinction between going for the green or laying up with features like a water hazard to clear or a collection of bunkers to avoid. However Coore and Crenshaw decided to put a greater premium on accuracy and fairway contours rather than brute strength. A ball can be chased up the left side of the hole and filter onto the green with precision avoidance of bunkering up the side of hole. A tee shot coming in from the right side of the fairway needs a right-to-left bend and carry to fight against the left-to-right sloping fairway in order to find the putting surface. Anything hit dead straight will likely filter to the right side of the hole, or potentially go through the back of the green. This hole becomes a great match play setting due to more balanced risk/reward situation offered to the accurate hitter along with the long baller. Bogey Beware: 15th Hole – 469 Yard Par 4 – At Sand Hills, the wind blows. Just bank on it like you would at Bandon. Unlike Bandon, the wind direction is much tougher to predict than Sand Hills and often changes during the round. When you reach the 15th hole, pray that the wind is at your back because playing into a stiff two-club wind here make GIRs drop to a tiny number. Devoid of heavy bunkering unlike many of Sand Hills' other holes, this long hole plays uphill and comes late in the round when your body likely isn't at full strength. Muster up everything you have to challenge this left-to-right hole and try to minimize the damage.